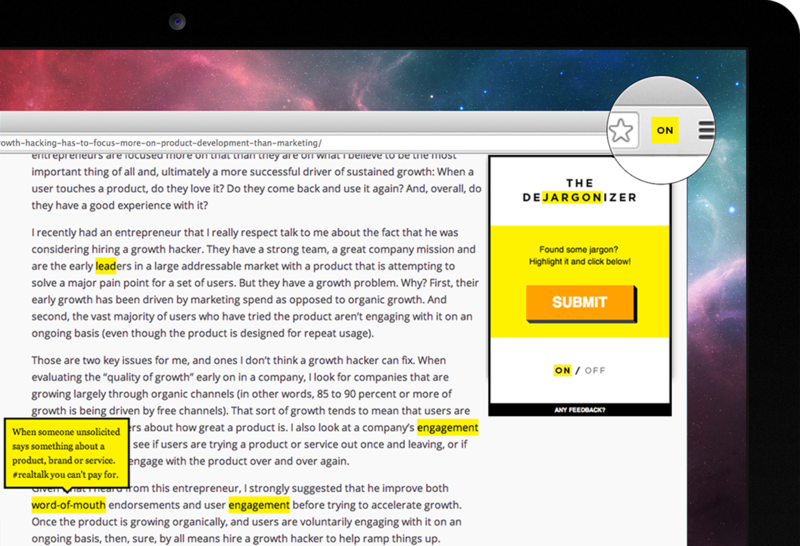 A simple Chrome extension that dejargonizes marketing terms as you browse the web. OOPS! Chrome extensions don't work on mobile devices yet. Would you like us to send you the Chrome Store link? + GOT FEEDBACK FOR US? *When you submit feedback, the Dejargonizer team may keep a record of your communication to help solve any issues you might be facing. If you choose to provide your email address, we may use that information to solicit further feedback and let you know about upcoming changes, improvements, and new product releases. We'll email you the link shortly!